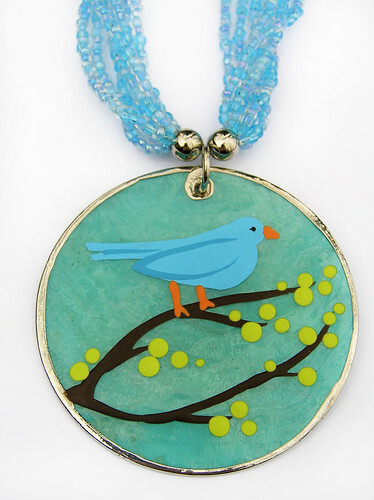 I just wanted to mention I have a new spring necklace in my shop, featuring my “on a limb” painting on a teal shell pendant. I also have a new tote set featuring Oakley the Owl. Look for it to be listed early this week. Its the perfect size for carrying stuff to the beach! My workplace had their annual meeting today, which also included a chili cook-off and a military theme. 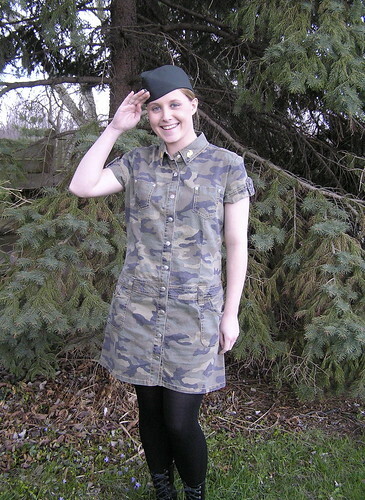 I thought some of you may enjoy the photo I’m about to post… this is me in my semi-WAC (women’s army corps) outfit. I wanted to get an authentic WAC unimform to wear but I didn’t like the $150 price tag it had. I opted for this camo dress which I found for $5 at Sears! The garrison cap and collar insignia are authentic which I ordered from eBay. I wound up winning 2nd place for my outfit. Not only did I win a nice martini set for my outfit, I also walked away with a new propane grill after winning second place with my chilli…and the nickname of “Rosie”.